No Change in Position—Skirmishing on the Right and Centre—The Men Well Protected By Breastworks—Sociability between Our Men and the Enemy—A Novel Gun—Visit of General Meade. 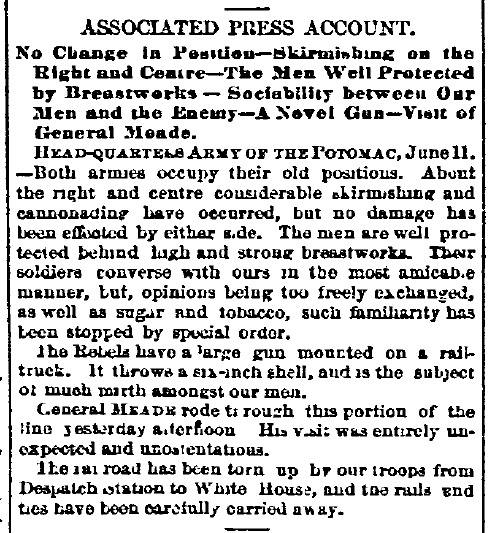 HEAD-QUARTERS ARMY OF THE POTOMAC, June 11.—Both armies occupy their old positions. About the right and centre considerable skirmishing and cannonading have occurred, but no damage has been effected by either side. The men are well protected behind high and strong breastworks. Their soldiers converse with ours in the most amicable manner, but, opinions being too freely exchanged, as well as sugar and tobacco, such familiarity has been stopped by special order. The Rebels have a large gun mounted on a rail truck. It throws a six-inch shell, and is the subject of much mirth amongst our men. General MEADE rode through this portion of the line yesterday afternoon. His visit was entirely unexpected and unostentatious.